We couldn’t agree more! Here is their story…. Hollie and Colin have the Mother-of-the-Bride to thank for their happily ever after. Colin and Hollie met at a small local bar and grill. She was out with her family celebrating her Mom’s birthday and she noticed a very handsome gentleman walk in. As fate would have it, Colin worked with Hollie’s Mom and she recognized him. They talked a little bit that night and the rest is history! Fast forward to engagement time, and Colin really pulled out all the stops. The Bride recounts that they went out for a romantic dinner and then he took her for a hike around a nature reserve that they like. The Bride and Groom chose to do a ‘First Look’ photo session before their wedding ceremony. Hollie found her stunning wedding dress at Erika’s Bridal in Neenah, WI. There was a small locket on the bridal bouquet. Hollie explains that the locket was a gift that Colin had saved his money for and bought his mother when he was eight years old. Inside was a picture of Colin at eight years old. How fabulous is that for your ‘Something Old’ good luck charm? With thanks to wedding coordinator Pilar Gonzalez Fernandez. At the reception, the Bride and Groom used her parents’ own cake topper on their wedding cake. It was most important to Hollie and Colin that their wedding guests had a good time, and they did, with help from DJ Diego, Evolution Mix Audiovisuals. Hollie and Colin, we wish you every happiness as you start this next chapter of your lives together, and we thank you for the honor of capturing your big day! CONGRATULATIONS! 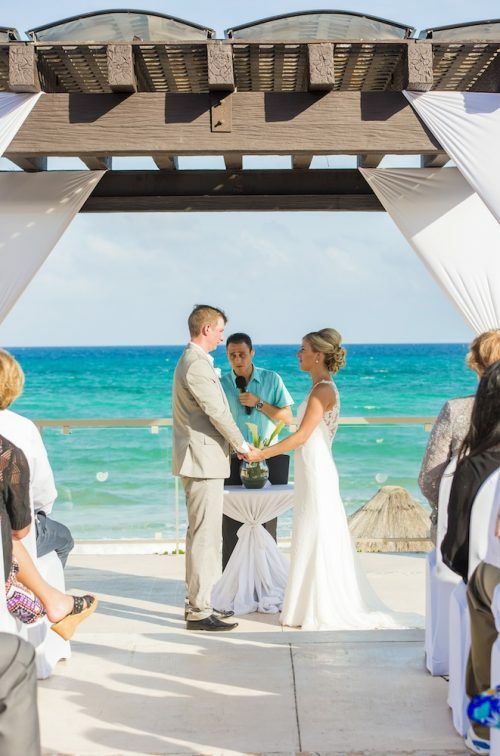 If you are looking for a professional wedding photographer here in the beautiful Riviera Maya, Mexico, contact us here today! 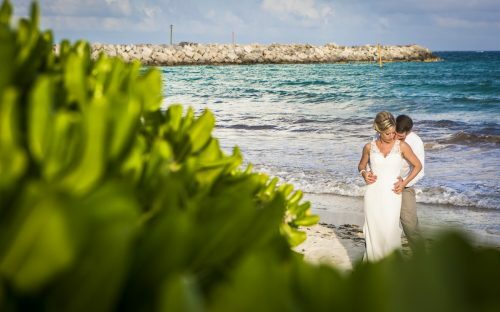 We are Fun in the Sun Weddings, your number #1 choice for wedding photography in the Riviera Maya. 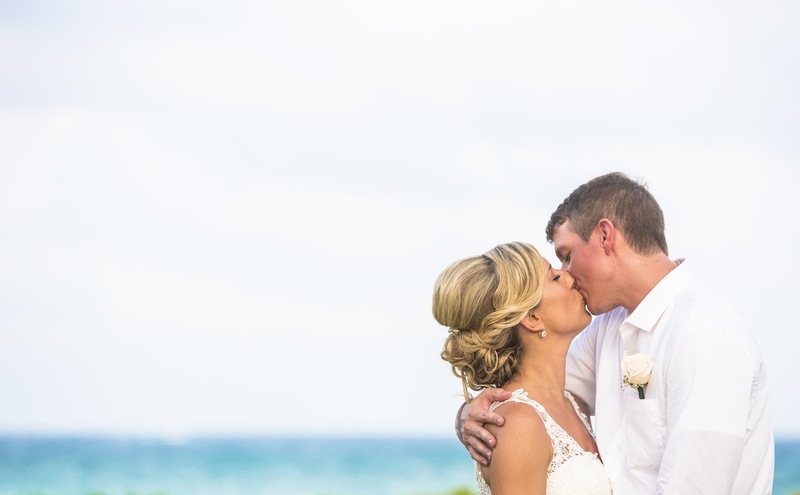 My husband and I used Fun In The Sun Weddings as the photographers for our wedding in Riviera Maya, Mexico. Our travel agent recommended Gillian and Marc, after viewing their work we decided to hire them to capture our special day. Initial contact was quick and easy, I always received a timely reply and had any questions and concerns answered. Gillian also made me feel at ease about any wedding day concerns I had. On the day of our wedding my husband and I along with our family and friends were so impressed with the service. They truly made us feel at ease and were so fun! Marc had great ideas for poses, locations around the resort etc and the photos are stunning! We could not be any happier with the final product, our photos are beautiful and creative. We are 100% satisfied and would definitely recommend them.